If you can drag yourself away from wine touring then the fabulous beach town of Arcachon and the Arcachon Basin should be on your priority list to explore next. 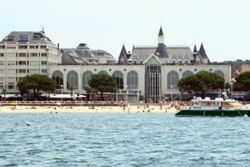 Just a half an hour or so from the city of Bordeaux, on the Côte d’Argent of the Atlantic in South west France, Arcachon’s wonderful beaches and warm weather awaits. It is known as one of the most chic seaside resorts in France. The original residential architecture, a type of Victorian, was established by wealthy Parisians. When the railway connected Arcachon in 1857, they quickly discovered this rich, oyster filled bay. Restaurants, shopping, parks, hotels, apartments and bed and breakfasts are now well established and we’ve found those that will give you, as the Bordelasie never tire of saying, "a taste of the good life". 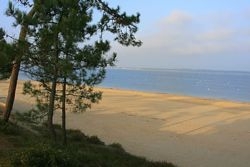 The town of Arcachon is divided into the names of the seasons, L’Hiver, (Winter) being the most sumptuous and Ville d’Ete (Summer) closest to the beach. Here you’ll find a great selection of restaurants from which to sample the famous oysters of the area and of course continue your wine tasting studies. The best way to see the town is really on foot or by bike so that you can browse through the many colourful beach stores. Spectacular white sandy beaches and dunes are surrounded by forest and you might enjoy a bicycle tour of the area. The impressive Dune du Pilat is Europe’s tallest sand dune and lies just south of the town - nearly 3 kilometres long, 500 metres wide, reaching 107 metres in height. Try surfing down on a bodyboard - http://myde.st/KEuUGs . Destinations in Arcachon: Mussee Aquarium, 2 rue du Professeur-Jolyet ( 33 (05) 56 83 33 32 ), Admission : €4,90 (adult), €3,15 (children), open all year except Saturday mornings. Created in 1865, the museum houses one of the oldest aquariums in the world and is a great place to check out the diverse species of marine life in the area. The Parc Mauresque (Moorish Park) and Lift, the lift is at the end of Marechal-de-Lattre-deTassigny street. (Great postcard reading stuck to walls.) Go up to the Parc Mauresque for a great view and orientation of the area. Open: Summer 7am – 10pm, Winter 8am – 7:30pm. Sainte Cecile Observatory (beside Parc Mauresque – Moorish Park), admission: Free. Can be reached via the lift or the Saint-Paul foot bridge and is open every day from 9am- 7pm. Fabulous view of entire town and part of the Arcachon Bay from this original metal structure observatory above the Ville d’Hiver (Winter Town). In the Arcachon Basin: Dune du Pilat, Andernos-Les-Bains, Ares, Cap Ferret, Lande Life, L’Herbe.